Golden Globe winner and Emmy Award nominee Robin Wright returns as President of the United States in the award-winning, smash series. She will be joined by Academy Award nominees Diane Lane and Greg Kinnear as well as Cody Fern this season alongside Emmy Award nominee Michael Kelly, Jayne Atkinson, Academy Award nominee Patricia Clarkson, Emmy Award Nominee Constance Zimmer, Derek Cecil, Campbell Scott and Boris McGiver. Melissa James Gibson and Frank Pugliese continue as showrunners for season six, and they serve as executive producers along with Robin Wright, David Fincher, Joshua Donen, Dana Brunetti, Eric Roth, Michael Dobbs and Andrew Davies. Created by Beau Willimon, House of Cards is produced by Donen/Fincher/Roth and Trigger Street Productions, Inc. in associated with Media Rights Capital for Netflix. Earlier this month, a teaser was released via the show’s Twitter account showing Claire addressing the camera with a cutting monologue (SPOILERS AHEAD). I’ll tell you this though Francis. When they bury me, it won’t be in my backyard. And when they pay their respects, they’ll have to wait in line. The camera then pans away to show Frank Underwood (played by Kevin Spacey) is dead and buried beside his loathed father – Calvin T. Underwood – whose grave the sociopathic politician once urinated over as a sign of contempt. This clip is arguably a throw back to the infamous scene, with Claire seemingly enjoying the prospect of earning the sort of immortal legacy her ruthlessly ambitious husband never quite achieved in life. The teaser – posted September 5 – has elicited quite a response, with many intrigued by the dramatically different direction the prestige political drama has taken in the wake of the allegations made against Spacey. In season six, Claire appears unrecognisable to the Lady Macbeth type of character we came to know in season one, intent on pushing her husband onwards and upwards through every sadistic and shocking power move. Widowed Claire is now motivated by her own goals and desires, and will clearly become the main focus of the drama. 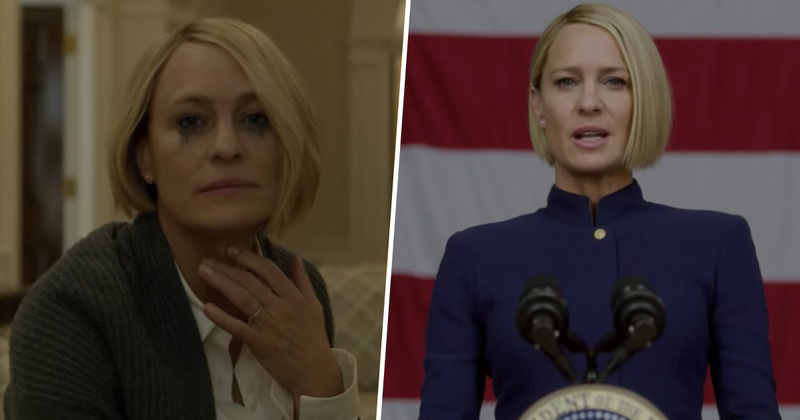 Even though this was perhaps never the direction the show originally intended, it will still be interesting to see where this fresh dynamic takes us as the Underwood’s savage rise to power finally reaches a conclusion. I don’t know about you, but I think we’re in for a pretty cut-throat conclusive treat.